Several countries have cut ties with Qatar, accusing it of supporting terrorism in the Gulf region. Neighbours including Saudi Arabia and the United Arab Emirates (UAE) have closed their airspace to Qatari planes. I have a flight going to Pisa via Doha with Qatar Airways. 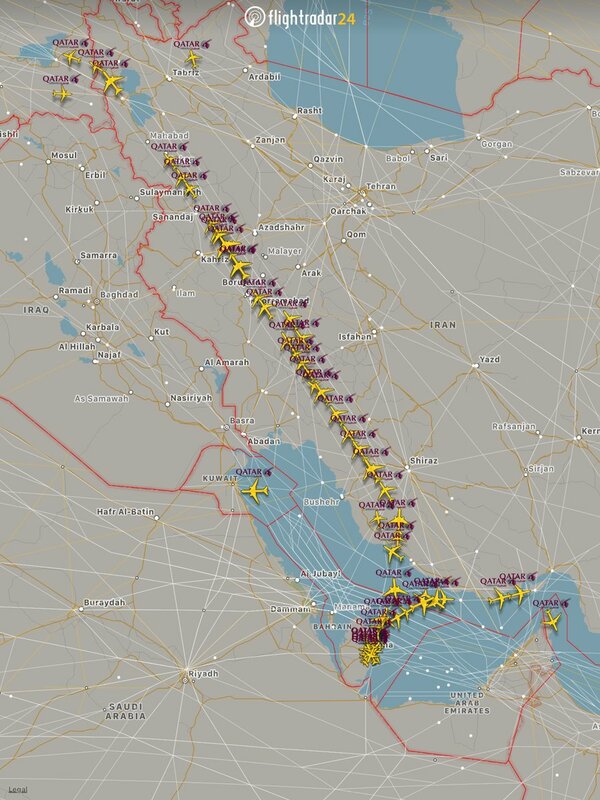 If it's banned from using the Bahrain, UAE, and Saudi airspaces, then what will be its route? Should I be worried about my flight? and from there to Turkey and Europe. As Alexander notes, this is because they can still use the Bahrain airspace; Bahrain committed to the IASTA which forbids them to close the airspace to other members, like Qatar. In any case, you should definitely pay attention to any information regarding your flight, and you can expect it to take a little longer because of the detour. Based on the FlightAware site, many flights are unaffected, some (mostly flights to south Europe) will have to fly longer. Flights to east and north Europe fly over Iran and Turkey, and are unaffected. Flights to south Europe fly over Saudi Arabia and Egypt, which have blocked their airspace. They'll have to take a longer path, over Iran and Turkey. Flights to east Asia fly over the Persian Gulf and Iran and are unaffected. Flights to Africa fly over Saudi Arabia. They'll have to take a longer path, around the Arabian peninsula. Flights to Jordan fly over Saudi Arabia. They now take a longer path over Iraq (which is normally avoided by all carriers). Not the answer you're looking for? Browse other questions tagged air-travel event-based-effects qatar-airways qatar or ask your own question. Travel from Hanoi to Chiang Mai via BKK by Qatar/Bangkok airways. What is the luggage allowance, how many pieces and dimensions? Can I bring these OTC medicines to India from the UK via Doha? What will happen if I will purchase a plane tickets being under 18?